Vitalik reckons that scalability and simplicity are key to the development of new technology. 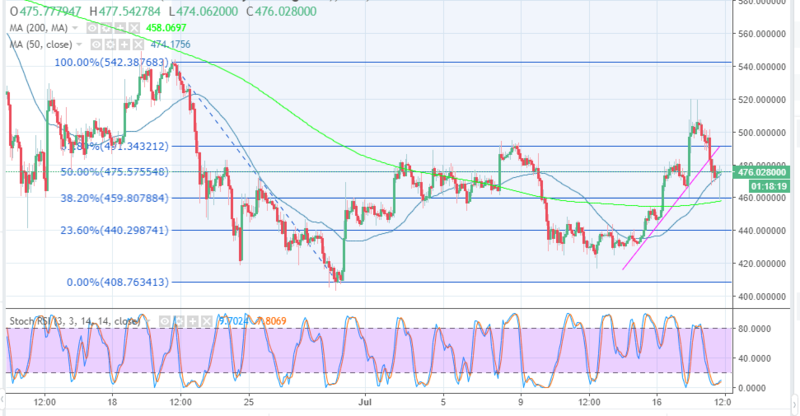 Ethereum price is supported by the 50 SMA while immediate resistance is limiting recoil at $480. Ethereum tested the waters upstream above $500 but it lacked the momentum to maintain the tempo. It has slipped back below the trendline, although it is supported slightly above $470. The trend is generally bearish on Thursday but the price seems to have found a balance after bouncing from the short-term support. In other news, Ethereum co-founder Vitalik Buterin while in an interview with Tyler Cowen, reckoned that scalability and simplicity are key to the development of new technology. He also talked about the user experience an essential part of creating technologies for the mainstream market. "Another big one is user experience – both user experience in terms of using the blockchain, not being as clunky as it is today, but also user experience of security." The price is currently flirting with the 50% Fibonacci level between the highs of $542.38 and lows of $408.7 slightly below $480. The crypto is also supported by the 50 SMA on the 2-hour timeframe chart. On the upside, $480 is an immediate resistance and hurdle in the short-term towards $500. The stochastic is at 10% but pointing north, which means that there is buying pressure building at the moment. Therefore, ETH/USD is likely to continue retracing upwards in the short-term.